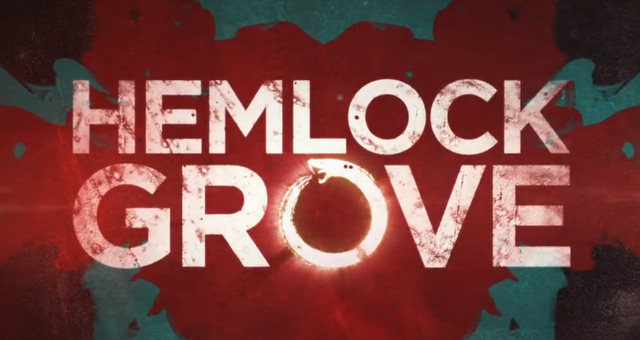 Last night I finished “Hemlock Grove” the Netflix original series created by Eli Roth based on the book written by Brian McGreevy. The show depicts a town in which a series of grisly murders makes everyone a suspect and everyone suspicious. The lead suspect in all of this is Peter Rumanecek, played by Landon Liboroin, who moved to Hemlock Grove shortly before the murders began and due to the rumors spread by Christine Wendall, Freya Tingley, that he is a werewolf, he becomes suspect number one. Despite this, heir to the Godrey estate and pale bad boy, Roman, played by Bill Skarsgard, decides to befriend Peter because he really just wants to. His mother, Oliva, played by Famke Jansenn, doesn’t want him to because well hanging out with the lower class is just so beneath them. Peter’s mom, Lynda, played fantastically well by Lili Taylor, reflects this thinking while believing that the Rumanceks are the ones in the right. Roman’s cousin, Letha, played by Penelope Mitchell, also becomes involved in this controversy while Roman’s sister, Shelley, played by Nicole Bovin, also feels an attraction to Peter, due to the fact that he doesn’t see her as a freak but a person. Phew, did I cover it all? Probably not because there is a lot going on in this show. When i first began this show, I was determined to get through it despite the terrible lines and the poor acting and I have to say, it was worth it. I felt like I became more engaged within the show due to the fact that there were very few slip ups and the continuity made sense. A friend of mine compared this show to “Lost” and I completely agree with that comparison. Not everything is explained in “Lost” and some episodes and characters were just plain awful, but despite that I still enjoyed “Lost” I just had to get through it. The same rings true for this show. Watch it until the end. It has a pretty sweet finale and leaves a lot open to speculation, which I like. I think some people would not enjoy the show specifically for that reason, that not everything is answered. But before I ask and possibly answer my own questions, I have to recommend that you watch this show all the way through. there is supposed to be another season on Netflix and I honestly cannot wait for it. Now onto my spoiler ridden questions/speculations! I don’t think Letha is dead. I think she was reborn in the square that we glimpsed at the end. I think that was her. She was such a good character and to kill her off so shockingly just seemed too unreal. I just don’t believe it, so I think she is part of the project that doctor Pryce is working on. Why was Pryce so upset at the end? I honestly didn’t think he felt that way about Letha and I don’t know why he smashed the table, any speculation as to why this happened? I liked Roman finally manning up. I also liked the twist that in order to become a vampire, he had to kill himself. See Olivia die was totally worth watching that whole series. Do you think Shelly is still alive or do you think she is an angel, as per Roman’s beliefs? I think she is alive and well and will return for season 2. She was one of the best characters on the show and if they do not have her come back they will be really missing out. What’s with the tail? What do you think that signified? How about that twist? I never suspected Christina whatsoever. I did not like Peter’s half hearted attempt at fighting her, not sure why he just didn’t kill her before she changed. but whatever, she’s dead that’s all that matters. Finally, I want to end this review with stating how much I loved Lynda’s speech to Peter at the end. That right there was the clincher for me in deciding who had the best performance in the show. She absolutely did. Whoever wrote her lines, awesome job. Seriously, I want to memorize that speech and say it to anyone that is experiencing a loss because it is just so damn good.